No matter which team you’re rooting for, or even if you just watch the Super Bowl for the commercials, every fan agrees on what makes a Super Bowl party a true winner: a great lineup of food. And just like with an NFL team roster, your food menu needs a wide range of talent to be successful. 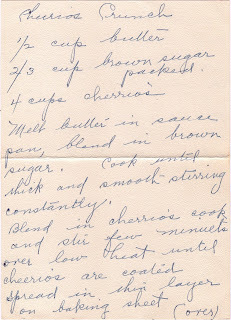 While digging through the recipes in the Found Recipe Box, I discovered just the thing to add to every menu. And best of all, it fits the requirements of any good party snack: easy to make, great tasting, and guests can grab a handful every time they pass the bowl. Introducing your next party MVP: Cheerios Crunch. This recipe only has three ingredients and can be completed in about 15 minutes. 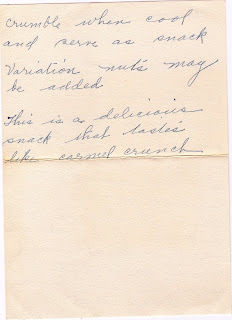 The author of the recipe writes, “This is a delicious snack that tastes like caramel crunch.” I couldn’t agree more. I was skeptical at first, but after I popped a few pieces into my mouth, I was a huge fan. And every time I walked through the kitchen I grabbed a handful for me and threw a few pieces on the floor for Murphy (who figured out this game quickly and just sat in the kitchen staring at the bowl waiting for me to walk back through and sprinkle more on the floor for him). So when you’re planning your gathering for Sunday, be sure to consider Cheerios Crunch for the guest list. It’s sure to be a crowd pleaser and won’t take much time out of your day, or money out of your wallet, to make. And if you need a break from all the pre-game chatter on the TV, flip the channel to Animal Planet and watch Puppy Bowl VI. Every year Murphy spends the afternoon trying to figure out a way to climb into the television and play with all the puppies. I wonder if he’ll give up that quest this year and just focus on trying to telepathically spill the bowl of Cheerios Crunch onto the floor instead. Yum! Sounds good Molly! And even better - less than five ingredients. I love the pictures of Murphy - what a cutie. 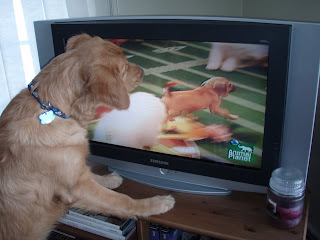 The Puppy Channel(R) loves The Puppy Bowl! And because there's been some confusion about this, we believe we should tell you that neither thepuppychannel.com nor our parent, the CHANNEMALS(SM) is related to that Super Sunday show, or its momma, Animal Planet, or its poppa, Discovery Communications. We respect and admire them and will be watching on 2/7. Other times, we invite you to thepuppychannel.com for a smile break! Woof!